Scrumptious garlic mushrooms drowning in butter and herbs. Hearty enough to serve as a main course for vegetarians or side dish to a juicy steak. Two of my favorite things, garlic and butter, combine to make one of the ONLY mushroom dish I’ll eat: Garlic Mushrooms with Butter Sauce. The other mushroom dish I’ll eat? These red wine sauteed mushrooms. 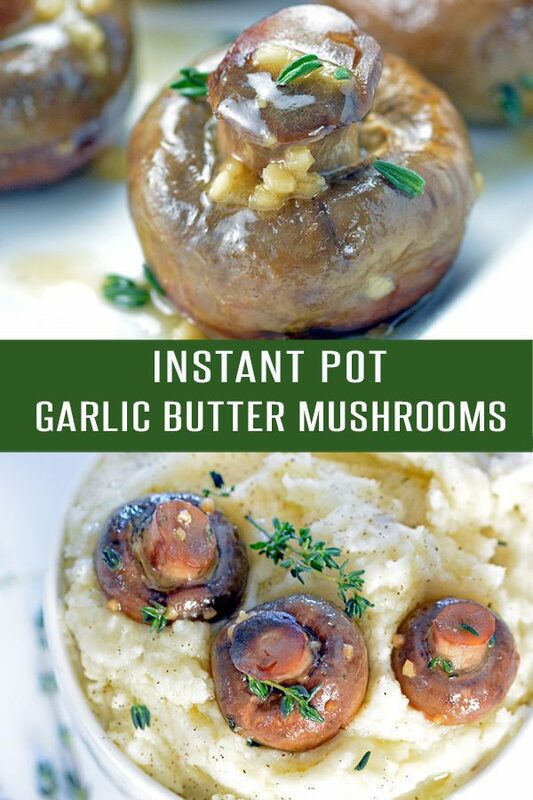 Truth be told I wasn’t sure how these garlic mushrooms would turn out using an Instant Pot (this is the version I own). I did a ton of research and couldn’t find much in terms of how long it takes to cook mushrooms in the Instant Pot. I knew there would be quite a bit of trial and error. To start, I decided to keep the instant pot recipe as close to my stovetop version as possible (Roasted Mushrooms). Guess what….I hit the nail on the head the first run. There were minimal adaptions needed to make it a success in an Instant Pot. 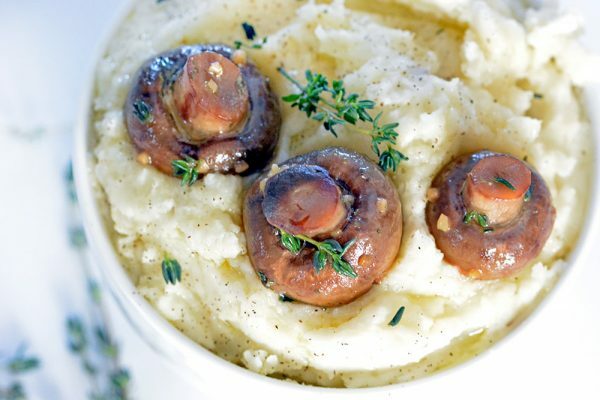 Instant Pot mushrooms…who knew? While you’re out grilling steaks this summer these Garlic Butter Mushroom can be cooking with limited supervision. Instead enjoy the time soaking up the sun rays and playing corn hole. Don’t forget to grab some crusty french bread to soak up the delicious garlic butter. Or else you’ll find yourself licking the bowl clean. Let’s just say personal experience is how I know this. Mushrooms in garlic butter sauce is also a perfect topper to mashed potatoes. Add in some sautéed spinach and you have yourself a meatless meal. * Feel free to use small button mushrooms, or brown mushrooms or white mushrooms. I’ve used them all and they all turn out perfectly. * Do not soak or rinse your mushrooms to clean. Use a damp paper towel to remove dirt from the mushrooms. Mushrooms act like a sponge and will become water logged – this water will release when cooked watering down the sauce. * As Julia Child once said, “don’t crowd the mushrooms”. I’ve doubled the batch but the quality suffered drastically. The mushrooms are too crowded and “steam” cook. Too much liquid is released and the butter/garlic sauce is watered down. * Cooking time is between 12-15 minutes. If you like a firmer bite to your garlic butter mushrooms, set the cooking time to 12 minutes. If you prefer super soft mushrooms, set it to 15 minutes. * Don’t skimp on the butter. Yeah I said it. I actually add an extra tablespoon to the pan when it’s done cooking just to get more buttery garlicky goodness. 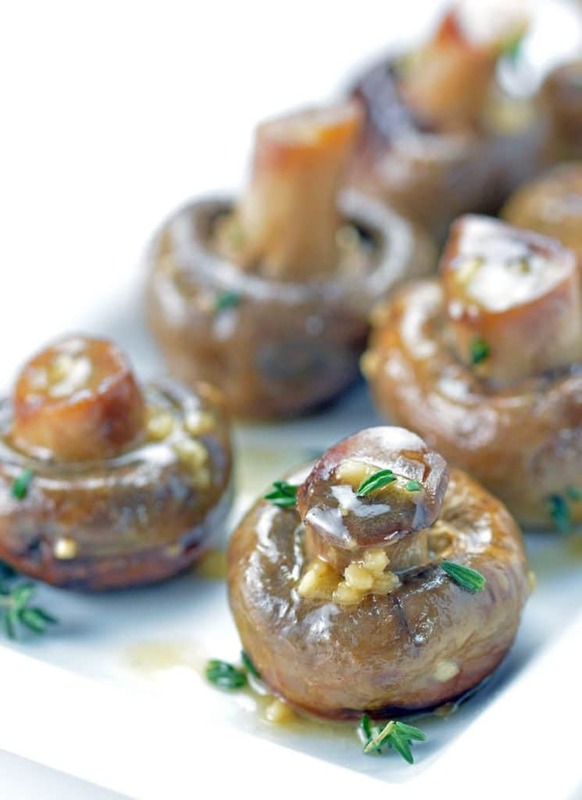 * These mushrooms are super rich and hearty. You can turn it into a vegetarian meal by serving it over polenta or bread. They pair nicely with a big fatty steak also. The choices are endless. * Garlic – I’m of the thought process there is no such thing as too much garlic. I’ve been known to add a bit more uncooked minced garlic to the butter sauce in my bowl. If you’re not a garlic-holic, the amount listed in the recipe is perfect. Scrumptious mushrooms drowning in butter, garlic and herbs. Hearty enough to serve as a main course for vegetarians or side dish to a juicy steak. Turn the Instant Pot on to sauté. Once hot add the olive oil. Add the mushrooms, cap side down and cook for about 5 minutes. Do not move the mushrooms until they have caramelized on the bottom. Add the butter, garlic, thyme and a pinch of salt and toss to coat. Place the top on the Instant Pot and set to cook at "High Pressure" for 12-15 minutes. Let NR for 5 minutes before quick releasing. OPTIONAL- add in another tsp of garlic and butter after cooking to amp up the flavors. Transfer to a serving platter and spoon the butter and garlic sauce over the mushrooms.